The Michigan Industrial and Technology Education Society (MITES) was established in 1928. It is a professional organization of industrial technology, technology education, and career technical education (CTE) educators whose purpose is the development of industrial and technology education at all levels of private and public education. With the support and generosity of the Abrams Foundation, MITES is able to offer a number of different scholarships and grants to help support Career and Technical Education in and around the great state of Michigan, Indiana, Ohio, and Canada. These scholarships and grants are used to help support the needs of students going into the teaching profession as a certified CTE and/or Industrial Education Instructor. They are also used to help support the needs of current CTE and/or Industrial Education Instructor’s with classroom mini grants, professional development grants, as well as programs which have demonstrated outstanding quality. 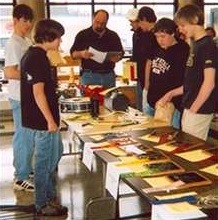 competition are held during the annual convention. Recognizes craftsmanship and problem solving in over 70 industrial and technology related categories. Encourages excellence and development of positive work ethics and habits. Encourages industrial and technology skills development. Encourages creativity, self-sufficiency, and critical thinking and problem solving. Encourages students to seek out careers in technology, skilled trades, and manufacturing and engineering. Offers scholarships for students to continue their education. Recruits judges from areas of industry and technology to judge in their areas of expertise. Functioning as a voluntary, non-profit organization, MITES is focused on the industrial technology, technology, and career technical education of the youth of Michigan and the professional development of industrial and technology education personnel and curriculum. MITES members are K- 12 teachers, college instructors, students, administrators, teacher educators, curriculum specialists, guidance counselors, and representatives of business, who recognize, assume, and participate in their professional roles. Programs of MITES members play a significant role in our education system and in our increasingly technical society. MITES is an organization through which all levels of industrial technology, technology education, and career technical education work at the local, state, and national levels to achieve their goals. MITES is a communication link with other educators to communicate current issues, curriculum, problems, changes, and emerging trends through the MITES Journal and Newsletter, and the MITES Annual Convention.